In screed electric underfloor heating cable as primary heat source. In screed, electric underfloor heating cables are an in floor heater. Our heating cables are designed to be buried under a 50-75mm thick bed of concrete screed. Consequently, the heating cable is ideally installed on a new build project during the construction stage. Working just like a water underfloor heating system does. Once installed the cable requires little to no maintenance. The in screed cable is an ultra-powerful and very durable heating cable. Which is very easy and quick to lay. The in screed Cable has a whopping 15-year manufacturer’s warranty. And is suitable for under all floor coverings. Making it an especially adaptable heating cable, for new build properties. As the final floor covering may not have been decided upon. Please feel free to call or email us directly 01803 316060 if you wish to discuss your project. 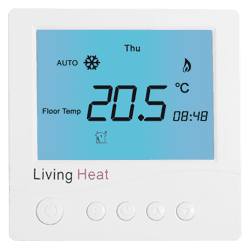 At Living Heat we offer a free design service, to make the whole process a little easier. If you would like a free quote or just a little more information. Please feel free to get in touch with us on 01803 316060. Our time and advice is free and we can recommend the best underfloor heating system for you. 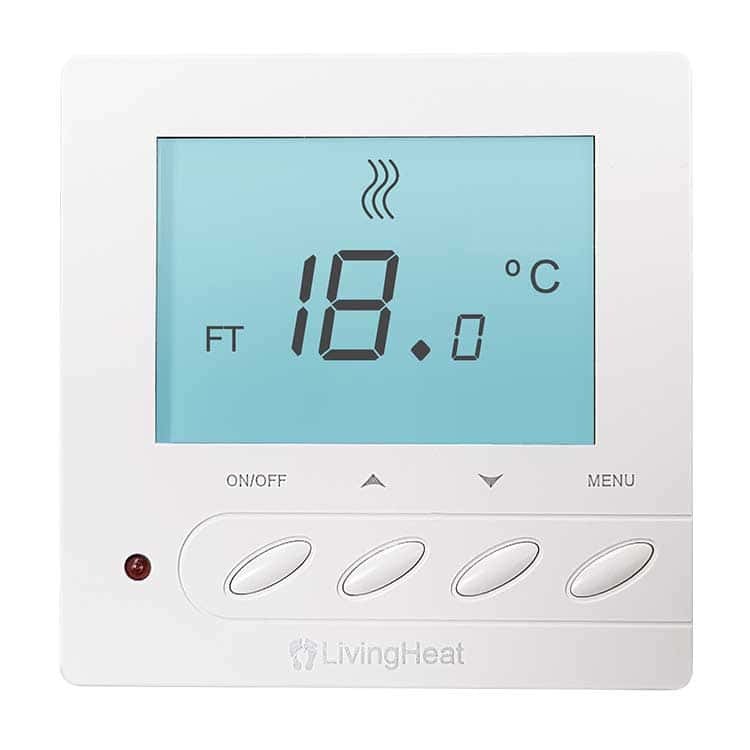 We offer one of the largest ranges of thermostat options which are ever expanding. All our Living Heat thermostats will fit a standard 1 gang back box. And can take a maximum load of 16amps or 3600 watts of heating without the need of a contact or relay switch. 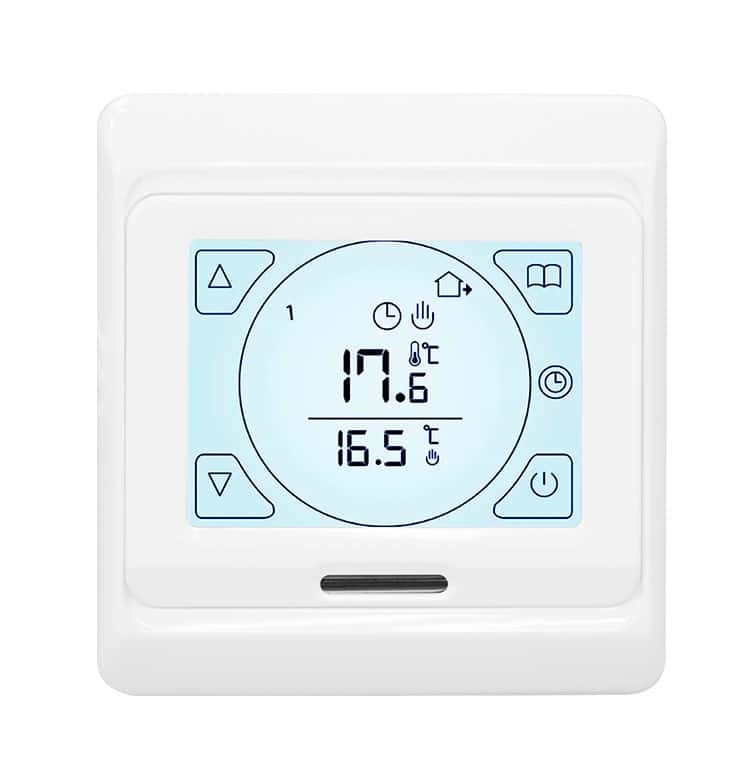 These industry leading thermostats are all designed to be easy to use and install. 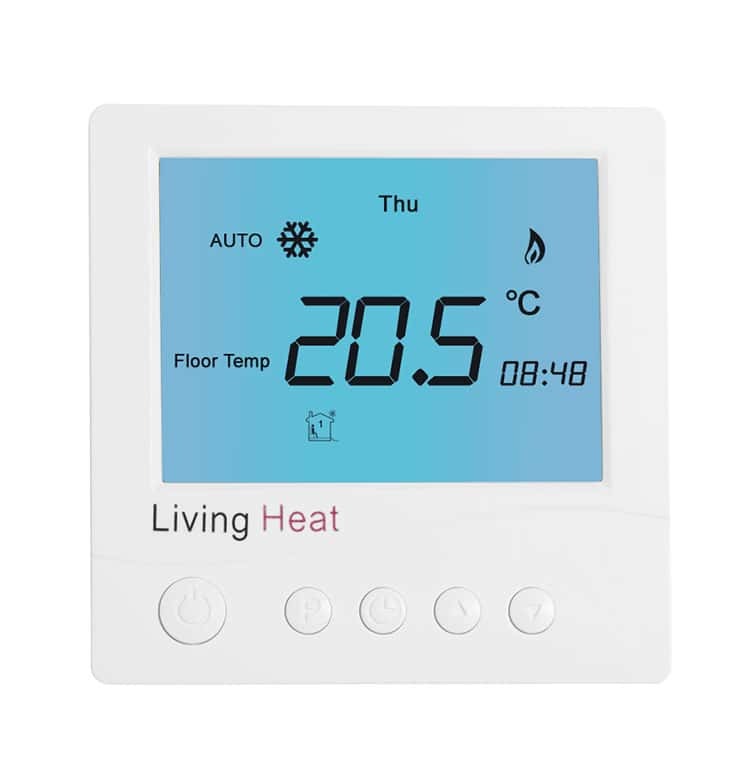 To find out more about each underfloor heating thermostats unique features. Starting at the bottom of your installation with the sub floor being either wood or concrete. 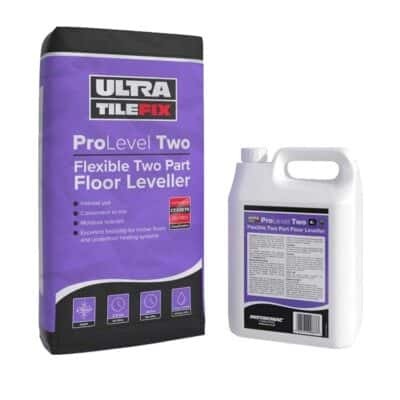 The first layer would be a thin bed of flexible tile adhesive about 4mm thick. 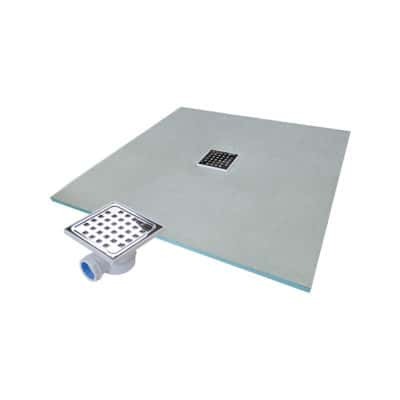 To stick down your insulation boards much like with the under tile heating systems. Next you’re underfloor heating insulation board itself. To reflect the heat into the concrete screed floor. This will also create a flat solid base to lay your underfloor heating cable onto. The cables are now laid and you will then need to pump 50-75mm of concrete screed over the top of the heating cables. And finally, the tiles can be stuck down with a standard 6mm bed of flexible adhesive. Please also ensure that the tiles are laid with an even bed of adhesive for equal heat distribution. 4mm bed of flexible adhesive. 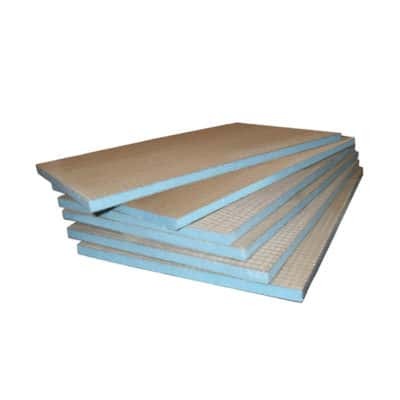 6mm insulation board. 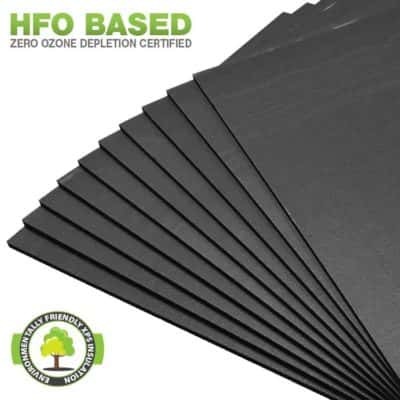 (10mm & 20mm insulation also available). 2.5mm in screed heating cable. Enveloped into the concrete screed. 6mm bed of tile adhesive. 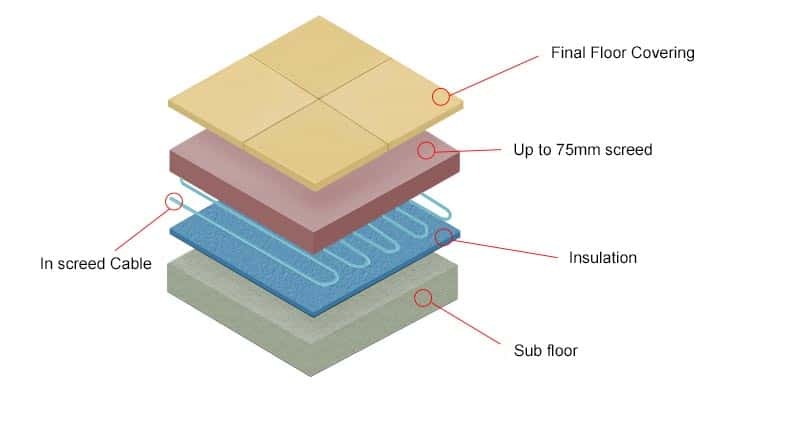 Making a total of an additional in screed electric underfloor heating floor height of 76mm thick, dependent on your chosen variables of insulation and tile heights. 15 year warranty on heating system. 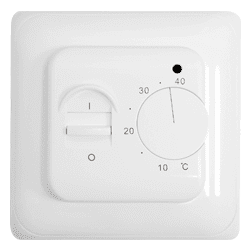 The Living Heat M100 Manual Thermostat is simple to use and easy to control with an on/off switch and a temperature turn dial. Controlled by a floor probe the temperature is always accurate and not effected by any external sources. Can control a maximum load of 16apms @230V before a contactor or relay switch is required. 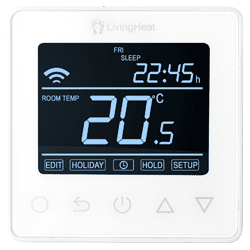 The Living Heat T700 Touchscreen thermostat offers all the features as the D600 controller with the added benefit of touch screen capability. 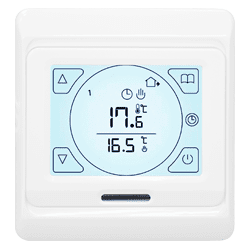 It can be controlled via the inbuilt air or floor probe sensor, with the option to program up to 6 temperature changes per day. Rated at a maximum load of 16apms @230V before a contactor or relay switch is needed. 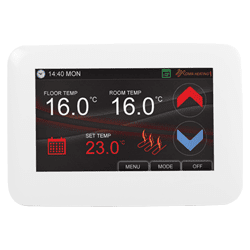 The Living Heat CT1000 Colour Touchscreen controller is our flagship thermostat offering a responsive colour LCD touch screen display. 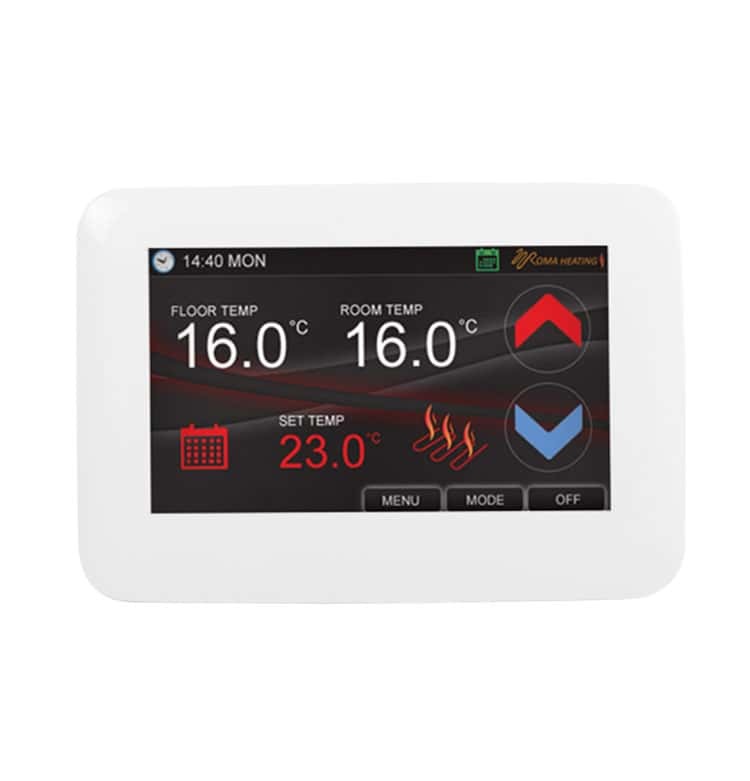 Can be controlled via inbuilt air or floor probe sensor, with the option to program up to 6 temperature changes per day. Rated at a maximum load of 16apms @230V before a contactor or relay switch is needed. 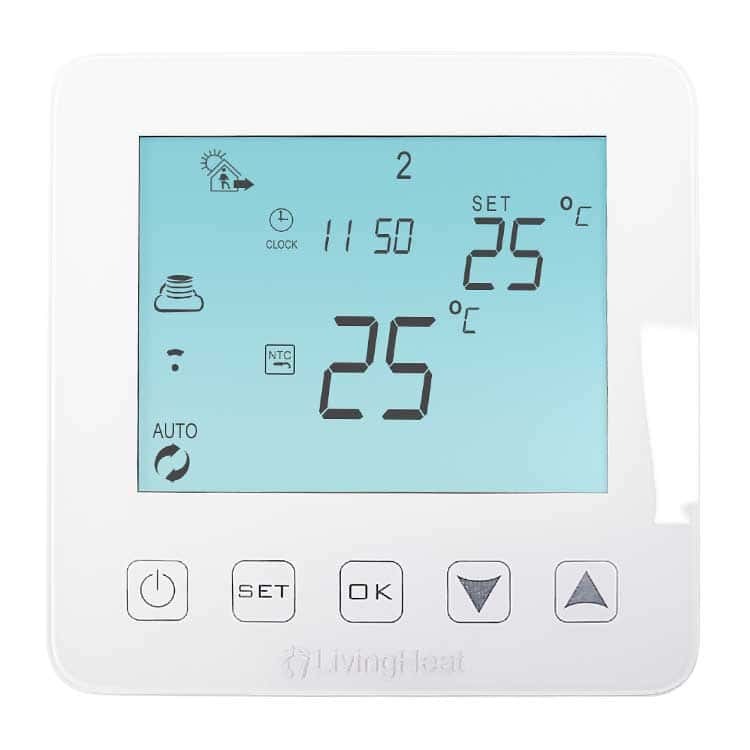 The Living Heat i8 Smart thermostat controller is Wi Fi ready and requires no additional hub unlike its competitors. 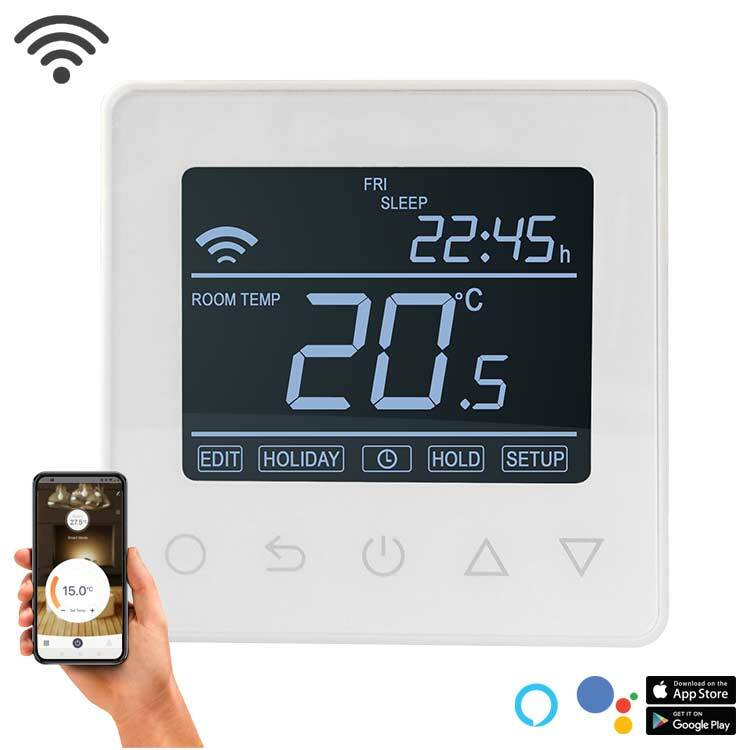 The simple to thermostat is fully programmable and can be run manually with the easy to use app. Can be controlled via inbuilt air or floor probe, with the option to program up to 4 temperature changes per day. Rated at a maximum load of 15apms @230V before a contactor or relay switch is needed. Orders placed before 12:00pm will be dispatched that day for a next working day delivery to all UK mainland addresses excluding, Channel islands & Eire on our entire range of heating products.